As a widow with three small children, Daniela Longo was unable to take on a regular job. With the idea of establishing her own business, she visited Lifting Generations, enrolling in the “Principles for Establishing a New Business” training course. Subsequently, Lifting Generations provided an opportunity for her to begin providing food service and catering to a prestigious company. To get the job, Daniela was required to compete with several competing food companies.Lifting Generations assisted Daniela in preparing for the interview, and helped create her business name, a combination of her children’s initials. Lifting Generations also helped her with preparing a professional menu. 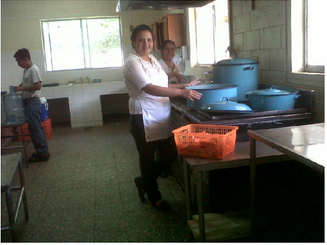 With Lifting Generations’ support, Daniela was hired to provide the company’s food. Once Daniela was hired, Lifting Generations continued to provide her with assistance. She was able to obtain a loan to start her catering business. In her first month, she sold 760 lunches at $3.37 apiece, for a total of $2,561.20, which enabled Daniela to hire two more cooks. Her employer made a kitchen with all the necessary utensils available to her so she would have a location for preparing meals. The training provided by our foundation taught Daniela the importance of saving money. Previously, she did not believe that she would ever be able to save. Now, her income has grown to $1,300 a month, and she has saved $450. She will be able to save an even greater amount when she has completed paying off her bank loan. Daniela says she feels that God never abandons widows, and that Lifting Generations has been a great blessing in her life.